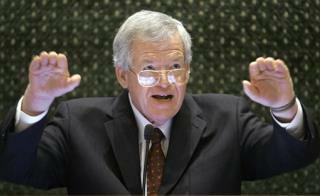 (Newser) – Former House Speaker Dennis Hastert might be about to learn an old political lesson: It's the coverup that will do you in. Federal prosecutors today charged the 73-year-old Illinois Republican with making shady bank withdrawals and lying to the FBI, and the Chicago Tribune provides this tantalizing detail: The charges allege that he needed the money because he had "agreed to pay $3.5 million in apparent hush money to a longtime acquaintance." The feds aren't saying what Hastert wanted his acquaintance—identified only as "Individual A"—to keep quiet about, only that it involved "past misconduct" by Hastert, reports CNN. The Tribune calls the indictment "stunning." He must have pulled a Jerry Sandusky with one of his former wrestlers and now is trying to bury it. And these are the conservatives that have told us time after time that they are morally superior to Dems. There is nothing more hypocritical and disgusting than a conservative. Can't wait for the CHARGES on Hillary! Then she will BOW out for the PREZ run! Hillary Clinton have broken federal record-keeping laws. While serving as President Obama's Secretary of State! Hillary Clinton used a private email address to conduct ALL official business. In fact, she didn’t even bother to set up an official government email account. Even though the Federal Records Act requires senior government officials to retain and preserve all written records, Hillary's aides did not preserve ANY of her personal emails during her tenure at the State Department! Many former and current National Archives officials called this a *"Serious Breach."*!! One former official said: All this follows reports that the Clinton Foundation accepted foreign donations during Hillary's tenure as Secretary of State!! 1000's of DONATIONS to the CLINTON Foundation that were not sent to the IRS was a MISTAKE! Ha,ha,ha,ha,ha,ha..etc... Mistake! I can't stop laughing!! Which makes you wonder: What was Hillary Clinton trying to hide? There ya go ALL!